or when new situations present themselves requiring decisions in the face of uncertainty. Controversy is in essence an argument between two competing ideologies represented by the Main Character (or the Protagonist) versus the Impact Character (or the Antagonist). One of the parties in the argument will be proved wrong, or may simply come to the realization he or she is wrong—meaning losing the argument, possibly resulting in embarrassment—and must therefore change beliefs or behavior. An unrecognized consequence of controversy is risk. Each participant in an argument faces the risk of being wrong, which itself is a motivating force. You may recall my discussion of the selfish Mayor—Articles 15 and 16—who opts to embezzle to protect his political posture. When we consider his risk, we can see his motivation is the risk, or fear, of public exposure. He elects to steal rather than admit his dire financial position and face the embarrassing political results. An examination of the path not taken, or the choice not made, affords the author an opportunity to consider controversy from a different perspective. How would the story turn out if, in the face of the risk, the Mayor made a different choice? In my novel The Naked Jaybird, Royce—the Main Character—becomes an agent of the law because of the risk of disappointing his father even though his father is dead. His wife realizes Royce chose the wrong career path, but still he cannot face the risk of earning his livelihood through his natural artistic talent, despite the personal problems he faces that make his life difficult. Each emotional crisis in the story ends as Royce reaches for his sketchpad, but he never realizes he must make a conscious decision to give up the law for an artistic career until the last page. How would the story be different if Royce defied his father, followed his natural artistic talents, but still became embroiled in the Chinese plot? Elsewhere in these articles I stressed the need to understand all characters have an interest in the outcome of the story problem, but now I add the warning that they do not have common risks. The principal characters may have more at stake than the secondary characters, but all have risks. The hero may follow the wrong leads and fail to unmask the villain if we portray the villain as clever enough to reverse the tables. Would the risk of the hero losing make a more suspenseful story? Considering a response to risk as a character motivator, or as an inhibitor, could broaden the portrayal of controversy and may even expose another character dimension. Risks intensify or moderate as the story progresses. The variations in risk create suspense and intensify emotional response. The reason is that at any given point in the story, one character stands to lose more than the other. But, as the argument progresses, the balance of power can shift, or can appear to shift, thereby redistributing the risk of failure and making the story more suspenseful. Checking The Verb "to be"
I have come to believe the use of the verb "to be" in its various forms receives the least consideration of any grammatical construction. The forms of the verb that permeate our language are: be, being, been, am, are, is, was, and were. They are in such common use and are so ordinary in our speech that we do not notice them because they do not confuse our meaning. Everybody understands when we say, "I looked in the cupboard and there it was." Nothing is wrong in the statement, but could I say it without using the verb to be? Certainly; "I looked in the cupboard and found it." 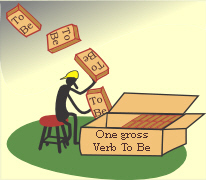 The verb "to be" is gone! That's strange. Perhaps we should look into this a little deeper. Consider the statement, "John was elated," which describes John's mental state or his being. Now, let's change the sentence to, "John was fighting his brother." This describes an action. Here, we could expel the "was" by changing the sentence to, "John fought his brother." If the time of the action is important to the context, we could insert a qualifier; "John fought his brother in the morning." This sentence describes an action and not a condition of being. Let's put the sentences together to see if we learn anything. "John was fighting his brother in the morning. He was elated when he won the prize." Now, let's rewrite by expelling the verb "to be." "John fought his brother in the morning. He elated when he won the prize." Now, we can see the difference between the action verb (fought) and the being verb (elated). The latter needs some form of the verb "to be" to make sense. Thus, we arrive at this rule: Use the proper form of the verb "to be" when describing a condition of being, but consider removing the verb "to be" when describing an action. To state it differently, when revising your work, look for opportunities to remove unnecessary occurrences of the verb "to be." Here is the comment of the late Professor Charles Darling, a great grammarian who established the Capital Community College grammar web site where you will find all the grammar you ever want to know. "In a way, the 'to be' verb doesn't do much for you—it just sits there—and text that is too heavily sprinkled with 'to be' verbs can feel sodden, or static." I want to make a couple of other points influenced by the presence of the "to be" verb. She knew the man who was driving the truck. Anyone who is going to school may board the bus. She knew that was the time to plant tulips. Undoubtedly, places exist where these idioms are acceptable, but if you use them in your speech, you may find them popping up too often in your writing. Heed the advice of Professor Darling. The Elements of Style, published in 1918 by Professor William Strunk Jr., included the following: "Vigorous writing is concise. A sentence should contain no unnecessary words, a paragraph no unnecessary sentences, for the same reason that a drawing should have no unnecessary lines and a machine no unnecessary parts." A paraphrase of Professor Strunk's oft-quoted phrase might read as follows: "A sentence should contain the words necessary for precise meaning, emotional impact, and vivid imagery for the same reason that no necessary line should be omitted from a drawing and no necessary part from a machine." The first statement appears to equate conciseness to reducing the number of words in a statement, whereas the stress on meaning, emotion, and imagery in the second statement could result in an increase in the number of words. We must be careful to avoid confusing conciseness with brevity. I do not believe they are synonymous, but that is exactly what my dictionary suggests in this definition: "Concise: brevity free from elaboration and superfluous detail." The question this brings to mind is whether it is possible to increase the number of words and still be concise? A regular correspondent submitted an article for comment that included this sentence: "How I longed to tell her how I loved her." Three sets of double usage—how, I and her—certainly violates Strunk. Nonetheless, the message is clear enough—a need to express deep affection—but the sentence fails. An attempt to comply with Strunk might be: "I longed to tell her about my love." The decrease from ten words to eight complies with the dictionary definition, particularly since elaboration and superfluous detail are absent. And therein lies the problem. Both sentences are short on meaning, emotion, and imagery. The narrator has inferred a pent-up wish to express her affection. In my view the verb longed fails to do this. I pause for a moment to make my readers aware of the narrator's situation. The story is that of a young woman caring for her dying mother who has Alzheimer's and can neither speak nor recognize her daughter. It is a powerful story inherently overflowing with emotion. The problem for the narrator is to find words that describe her devotion such as a pent-up cataclysm—a boiling caldron, for instance—unable to release her internal agitation so her mute disabled mother could hear it, see it, and understand it. This will add words—written concisely, of course—strengthening the article. This story is about a strong emotional experience; "... how I loved her ..." is too tame for the situation the author describes. Another sentence contained these words; "... the personal freedoms I fiercely guarded." I questioned what the author meant. How did the fierceness reveal itself? The synonyms of fierce are ferocious, barbarous, savage, and cruel that all mean showing fury or malignity in looks or actions, each with a slightly different connotation. I suggested replacing "fiercely" with a statement showing the emotional impact of her "guarded" freedoms in relationship to caring for her mother. This will result in yet another increase in the number of words, but I believe them justified because "fiercely guarded" is ambiguous and indefinite, which I think means not concise. I'll continue this story next week. Because of its beauty and drama, it is a worthwhile study in creative writing. Until next week, look at your own work for concise expressions of meaning, emotion, and imagery. Are you delivering the message you should be offering your reader? I continue my discussion of an article submitted by a regular correspondent. In another sentence, the author wrote: "Her milk-white hands clasped a yellowed handkerchief once belonging to my father. She stared at her fingertips without blinking as they lightly traced the outline of a cursive E embroidered on its corner." I suggested the author consider the meaning of "...lightly traced ..." in a romantic sense. I wanted her to climb the emotional ladder implied through the movement of her mother's hands and to tell readers what the letter E said to her mother? I recall a course on dramatic storytelling that I attended in Little Rock several years ago. One participant told a story about leaving home. She described a personal feeling she held for a particular tree and the emptiness she feared departing her mountain birthplace. In his comments, the Director asked her, "What did you say to the tree?" After the teller conceived an answer, the Director said, "Now, show me what the tree said to you." I never forgot that lesson. I believe we often miss the opportunity to hear what "trees" say to our characters. Whatever it may be, it is a highlight of emotional experience that our stories should disclose. Writing such poignant inwardness is a challenge. Among other considerations, it means adding words, which in turn demands word choice and composition free of elaboration and superfluous detail. To evaluate how you might write the scene, it helps to know the story ending. As the daughter watches, her mother's actions soon subside, the hand comes to rest, and the handkerchief drops to the floor. The author handled this scene superbly. The dropping of the handkerchief is the symbolic death of her father. The mother's head turns. She looks into her daughter's eyes. A moment of recognition occurs; they smile at each other. The daughter pauses to cherish the moment, then she leans over to caress her mother. She is too late—her mother is dead. This kind of storytelling is like a dream sequence. Each of us would, of course, handle it differently. My thoughts veer towards conjecturing on Mother coming out of her coma in preparation for leaving this world and meeting her lover anew. In consideration of Mother's mental incapacity, this cannot be rational thinking. It must be seen in her actions, her face, her eyes, ending with the trace of a smile when she recognizes her daughter's face, perhaps for the first time in years and the last time in this life. I think a certain individuality exists for those who are blessed to die in non-violent circumstances. In 1942, my father was in an oxygen tent, a precursor to the nose inhalers we have today. He lay still, his eyes closed, a half-smile on his lips. I thought he must be dreaming, somewhere in a hunting or fishing paradise. He looked peaceful and serene. His hand rose slowly. He waved to the nurse. She must have sensed he was about to die because she opened the tent releasing the oxygen-laden atmosphere. I don't know if his gaze went around the room, or if he even knew who was in the room with him. His eyes closed and the half-smile came back. In a second or two that seemed like an eternity, he opened his eyes, winked at the nurse, and was gone. I went from 4 to 7 words, added two items of information, and eliminated the "being" verb. Such a change is only legitimate if the additions are relevant to the story and essential to the reader's understanding. To grasp the significance, let's add the information contained in the second sentence to the first; Stephen is a writer. He writes for hours at the computer. (3) When the same information is included in one statement (2), you can see the second sentence is more concise than the third. Here is an entire paragraph from Goad of Honor. Now, let's revise it by eliminating the "being" verbs, underlined or noted in bold. Note how the attack on the "being" verbs in the passage led to uncovering the redundancy in the underlined sentence. Specifically, "in his own way" and "as he knew how" deliver the same message. Also, note the reconstruction of the bold sentence. This is revision at work, yielding a more concise paragraph. Part of the problem is recognizing the places in our own writing where editing will yield a benefit. My rule is to edit and reread until I go all the way through without finding an error. A common error of weakness in writing combines "being" verbs with active verbs ending in ING. For example; Stephen was sweeping the floor. This is not passive voice because the doer of the action is the subject. So what's wrong with the sentence? It's weak because the action has been watered down by adding WAS. I could write; Stephen swept the floor. This is a stronger sentence, not weakened by the addition of WAS, but I must consider the timing. A good reason to write "was sweeping" may exist. For example, I must write "Stephen was sweeping the floor when several children burst into the room" because the action is ongoing. Still, in many cases, omitting the verb of being and using the strong verb alone may be possible. Why can't I turn the sentence structure around? The children burst into the room while Stephen swept the floor? I could. This form uses a clause to make the sentence stronger with both verbs active, but Stephen's action was first and I must consider if this is important to the context; does it make a meaningful difference to the reader? Remember the active voice is stronger, meaning the doer of the action should be the subject. In active voice, the verb has only one part, like swept, sang, burst. When I see a two-part verb, I check if it is passive voice. It won't always be. As noted above, Stephen was sweeping the floor is active voice that has been watered down. The action word isn't the strong word: SWEEP, but the weaker verb form: SWEEPING. Passive voice would be: The floor was swept by Stephen. Now I have a two-part verb with the recipient of the action as the subject. Not all two or three part verbs are passive voice. The definition of passive voice is when the subject is acted upon instead of acting. For example, in the expression Mother baked a cake, the doer of the action, Mother, is the subject. Therefore, the verb BAKED is active. If I turn the sentence around—the cake was baked by mother—I have made the subject the word that is acted UPON. Cake becomes the subject and receives the action. Another way to analyze the condition is to identify the doer of the action and the recipient. Make the doer the subject and the verb will be active. Make the recipient of the action the subject and the verb will be passive. Another signal identifying the passive voice is verbs with more than one part. In the active voice sentence, the verb is one word: BAKED. In the passive voice sentence, the verb is TWO words: WAS BAKED. I'm sure you've heard the dictum: Never use passive voice. Never is a strong word, and should be used carefully, but very few reasons exist to use passive voice. I must play with sentences, especially in revision, asking myself; Should I revise this sentence to....? 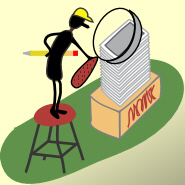 Check to see if the change will improve readability, conciseness, or ease of reading. Does the sentence still say or imply the emotion or image I want to impart to the reader? This is the real test. As I progress with my learning, corrections become automatic, but I have to be careful to avoid carelessness in my self-editing and not miss simple errors. I extracted the following quote from a letter by a Canadian writer residing in Burlington, Ontario, reporting his reaction after reading The Naked Jaybird. "I felt a part of what occurred throughout the book except the Chinese Prime Minister. I do not foresee the day when the buildings on Parliament Hill will be a refuge of the Chinese. In one sense, it was a bold stroke on your part; on the other side of the coin, it took something away from the reality edge. I thought there was not enough lead in for this character. This Canadian reader needs more time to adjust before the Chinese assume the highest office in the land." Readers' comments stimulate me. I am always excited to receive reviews of my work. They drive me to uncover errors and strive for techniques that will improve my writing. Apart from that, however, within a few weeks of receiving the letter from my Canadian correspondent, the Canadian Prime Minister appointed a native-born Canadian of Asian ancestry Governor-General of Canada. Although, an honorary role representing the Queen in Canada, it nonetheless underlines that Asians have achieved recognizable status in Canada. I note this in passing, not to belittle a particular Canadian reader, but to point out the possibility that not all Canadians share his conviction. What is the case in point? While all readers have the same facts—in this case, a large Asian population in Canada—not all readers will accept the same assumptions. In The Naked Jaybird, the first introduction of Harold Young, the future Prime Minister, is through a newspaper article that includes this description. "Mr. Young identifies himself as a Canadian insurgent, born in British Columbia. He shuns the earmark of his nationality as Chinese. He constantly reminds those who will listen that he is Canadian." When the protagonist comes face-to-face with Mr. Young for the first time, he sees ". . . sun-browned alabaster skin with hints of Oriental ancestry." Thus, I assumed that Harold Young's thoroughly Canadian birthright would elicit no objection from Canadian nationalists. "This is not as simple a subject as it might at first seem. The reason it's not simple is because making the right assumptions about character dictates what details the author adds or doesn't add to a story." ". . . to realize how many scenes you must supply to make a character feel real, the author must have a good sense of the readers' assumptions about character so the story does not suffer from lack of insight about characterization.
" To avoid making this mistake, the author must examine his or her own assumptions about the characters to decide if they are universal, or specific to the author. This isn't easy—examining our map of personal reality never is—but such examination can determine how much detail the reader needs. "The assumptions made about characters must be those shared by readers outside the author's particular background." I concluded the letter writer was ultra-sensitive, but I refrained from comment when I thanked him for motivating me to examine a topic I had not previously considered. A man decides he will devote his spare time in the winter to refinishing his boat. He stores the boat bottom up in a warehouse. He spends countless hours scraping, caulking, and painting. He launches it in the spring avoiding the slightest scratch to the new surface. With watchful eye, he guards against hazards that might mar his work. A friend asks to borrow the boat. The owner agrees, cautioning his friend to be careful. The friend takes his family on a picnic. When he drags the boat on to a beach, the sand scars the paint, but does no serious damage. Why do the two men treat the boat differently? The owner has a time investment that places a value on the painted hull; the borrower, with no time investment, exercises due care as requested without concern for a few minor scratches. So it is with the artist: The time investment in his work creates a value that no other person shares, but it is a subjective value. The artist believes his work is good. He may feign modesty, but in fact, he wants praise. On public display, the critics may have a negative opinion. When that opinion comes as objective criticism the artist is vulnerable, which brings his sensitivity into play. He resents the scratches on the bottom of his boat. More than that, the deeper the scratches the greater the degree of resentment. Stories of writers who reacted angrily to criticism are nothing new. Among the many old wives' words of wisdom we heard from our grandmothers is this one: If you can't stand the heat, get out of the kitchen. To relate this to the business of writing, if you can't bear criticism, then don't offer your work to the public. All critics and evaluators know the author has a lot of emotion invested in his work, but the reviewers, if they are worth their salt, will identify its flaws, and will praise good work when they find it. None of us has problems with praise, but all of us must learn to accept criticism. Before you discard the criticism, or sulk about unfairness, evaluate carefully: Is the critic wrong, or is the author so wrapped up in his own work as to be unable to see it from an objective point of view? A critical evaluation may be valid. Regard it as an opportunity to learn something new, even if that something is a negative from your point of view. The worst of all possible reactions is to close your mind to the benefits of harsh criticism and to castigate the reviewer. Whether you consent to a private critique, or your work is open for public comment, if something is amiss, then critics should bring it out. They may praise a well-turned phrase, but the writer presented the work for criticism, and can expect opinions on what might be wrong or how to improve it. To suggest that a submission is for some other purpose—to garner praise, for instance—makes no sense. Artists and critics should seek and understand frankness in their exchange. I know a capable actor who is shy. To overcome his shyness on the stage, he separates himself from the audience with "a glass wall." He acts on a stage unaware of the audience. He is so successful at isolating himself, he does not know the reaction his performance evokes, and he never reads reviews because he cannot bear criticism. If you are like this, then build "a glass wall" that separates you from the public, and do not open yourself to criticism. Publish where you can, but don't read the reviews. For the less sensitive, I say get as much critiquing as you possibly can. Regard every negative comment on your work as an experience from which you may benefit, and discard all positive praise. Analyze with care. Find the parts of your work that brought the negative remarks and determine if the comments are valid. If so, learn how to make corrections. On the other hand, if the critic has missed the point or overstepped in some way, never fight back. Nothing diminishes an author's stature as much as a public battle challenging critical statements and chastising reviewers. I have no sympathy for authors who react with anger to negative remarks about their work. Nor do I endorse those who prescribe that negative criticism—or private critiques for that matter—must start with a positive comment. To preface critical remarks with, "I don't want to hurt your feelings but . . ." is a waste. Finally, the worst of all possible critics is a friend or family member. Your work may be terrible, but the family does not know how to tell you this. They couch their remarks in vague terms, failing to reveal their true feelings, and hence they mislead you. If they are blunt and harsh, a host of hard feelings may result that could take years to dissipate. Ask for critiques from independent voices who have no interest in the outcome, and whom you can trust to offer an honest appraisal. And, don't be sensitive. I have written and talked extensively about story planning and preparation in my books and workshops in the last few years, but it is a topic I have not addressed in the Book Doctor series. Recently, I began to attach even more importance to it than in the past. This evolved from my conviction planned stories yield better stories, a statement that often leads to controversy from published writers. Despite objections and arguments, I persist in my believe that everything we do in life involves a plan, although we sometimes do not recognize it. A simple example is a shopping trip. You need new shoes. You select an outlet store, which is a destination, or end point of your plan. In other words, you know where you are going. Whether you realized it or not, you planned by identifying your destination. The analogy applies to storytelling; your experience at your destination is the crucial event. To develop the logic behind this theory, I will confine this discussion to short stories. To avoid repeating myself, I suggest a review of Article 13 and Article 14 that deal with developing a story line through characterization. I also recommend rereading Article 25 in which I developed the idea of a crucial event. With the background complete, let's continue the study of preparation. The first question to address is, Who will tell the story? If your immediate answer is, "I will," you are wrong. You are the creator or god of your fictional world, and like all gods, you use an agent to deliver your message. The character you select to fulfill that role is the point-of-view (POV) character. The uniqueness of this role is the reader knows everything the POV character knows, thinks, and senses. So we come to our first rule: Do not hide knowledge or thoughts the POV character may entertain: This is the only character whose thoughts you will explore and reveal. The unique feature of creative writing is the author's god-like ability to explore inside a character's head. This exclusive domain sets creative writing apart from every other arts medium. Authors who do not benefit from this attribute miss an essential ingredient of good writing. This means selecting the POV character deserves thoughtful consideration. In earlier articles, I wrote at length about distinguishing between protagonist and main character, as well as antagonist and obstacle character. I also introduced supporting characters using terms from Dramatica such as guardian, contagonist, skeptic, sidekick, and so on. Any one of these may fulfill the role of POV character. The most common is to make the protagonist POV, but I sometimes feel authors make the choice without considering other opportunities. A classic example of an author who selected outside the norm is Scott Fitzgerald's Nick Caraway in The Great Gatsby. Next week, I'll begin a discussion of objectives to consider when choosing a POV character. I begin this week by correcting the rule I misstated last week. I should have written: The POV character is the only character whose thoughts you will explore and reveal. It is not compulsory for the POV character to reveal everything he or she knows. It's easy to imagine a POV character concealing information. He might be guilty of a crime, be secretly married, or be the winner of a contest; anything is possible. I apologize. To return to the subject, suppose I intend to write a story about an ambitious young woman named Lucia Alvarez who dreams of wealth and high society. Her father, an author of crime stories, cannot interest any publishers in his work. The story characters are Lucia; her dead mother Maria; her father Edmundo Alvarez; an eligible and wealthy bachelor Otto de la Fuentes who owns and franchises convenience stores; Sergeant Grimes, a police inspector; and Miss Pollock, an airline attendant. The question is who should be the POV character and how to decide? The answer is any one of them—with the probable exception of the dead mother—could possibly fulfill the role. The important condition to recognize is each will have a different slant on the story. And this, surprisingly, brings me back to Article 35; examining the possibilities of different perspectives of the same story. Let's develop the idea to see where it leads. In the second paragraph of this article, I suggested a story line by developing characters; my prescribed technique of story creation. The other two essentials I have written about so often are defining the story problem and the destination, which I choose to call the crucial event. My first choice of story problem is how Lucia can escape poverty? Now, I put my imagination to work to see if I can develop an idea that might serve as a crucial event. Lucia, ashamed of her father, adopts her mother's birth name, Marisa Callas, as an alias. She finds work in one of Otto's stores. Her efficiency and good looks attract Otto's attention. He promotes her to manager and soon after she buys a franchise in her own name. Before long, she owns four franchises, but is heavily indebted to Otto. Meanwhile, her father, frustrated by his inability to get his work published, decides to perpetrate his crimes, which he claims are foolproof. He is so successful, he designs the master crime in which Otto will die and he and Lucia will receive the funds from his estate. The crucial event will take place during the sergeant's interrogation. The climax comes when Lucia double-crosses her father, reveals his complicity and disappears with the money. With this story snippet, I want to select a Point-of-View character. How? By considering those who are possibilities, and then developing the story from each candidate's point-of-view. Miss Pollock whose role is to provide testimony during the investigation. Only the POV character knows the information essential for the reader to understand the story, including the information that clarifies the story at the end. Next week, I will present story summaries for each POV candidate.